Finally huh.. 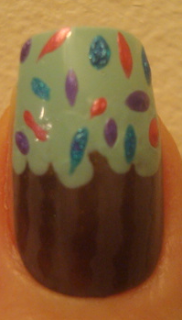 I posted my Readers Challenge a few posts back, and I actually got a challenge from Tier asking for cupcake nails. 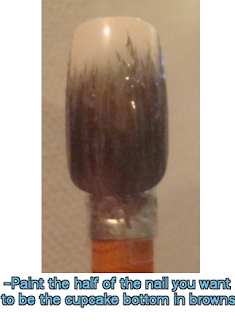 I posted a picture of what I had come up with, and she liked it, so onwards I went with the tutorial. Anyways, I apologize for the picture quality. I am looking into constructing a light box to see if that will help. I think it should. And there was a slight mishap which I will explain once we arrive at that point. Here is where the problem happened. I was allowing the nail some drying time before I would pop it onto my own nail to snap a photo.. My nail painting station/art station is in a very bad spot aka the floor.. My mother happened to stroll into my room.. AND buh-bye nail.. It got rolled over and smooshed and blah! 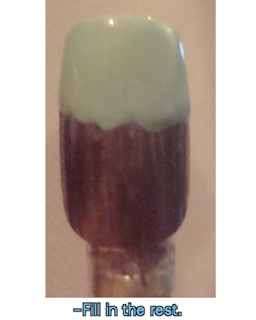 So this was the original nail, which I do like better in one way. I went with a different method for the cupcake bottom this time around, I think I like the defined lines better.. But to each their own. 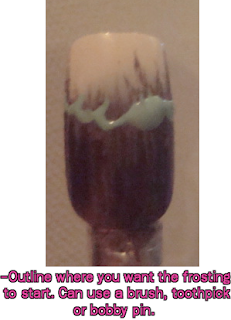 I hope this helped in some way to show you how to possibly do cupcake nail. 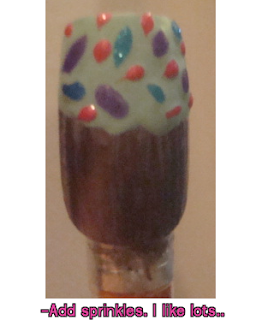 Another way I thought would be cute would be to have your nail a cupcake-y colour, then have a mini cupcake painted on to the nail.. Maybe I'll do that some day.. We'll see!! 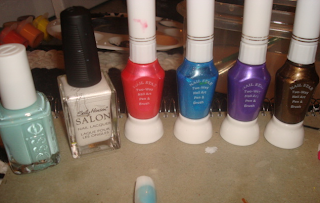 I need to paint my own nails again soon here.. It has been.. 3 days of nakedness!! Scary! But I did some damage to my middle nail.. I will try and snap a photo, I have been filing this mother down, but you can still see that I snagged it on something, lifted the nail bed a bit. Blergh! Ahh well..
Hope everyone is having a terrific Tuesday!! Tierney - I really like the toothpick method as well. I stayed far away from it due to intimidation, but am glad I finally gave it a whirl! Nice and easy!! shortnails - Yay Canadian bloggers!! I am always happy to find them myself to find out where they possibly get their polishes from.. Because we do not have any major suppliers, and those that do carry the brands I want, basically commit murder on the pricing!! Musicalhouses - Yay! I hope you do try it out, it is really a bunch of fun! shortnails - How you explained it is pretty much exactly what I did. There are some videos on youtube that you can check out for methods and such - but I think you have it down already!! I'll have to try that out soon! That looks so cute! Now I am off to eat a cupcake!